I’ve been lucky to visit New Orleans a few times over the last year and since it’s Mardi Gras tomorrow, I wanted to give some love to Johnny Vidacovich. Johnny is a legendary New Orleans musician and teacher, with students like Brian Blade and Stanton Moore. I was able to see him at the Maple Leaf over the holiday break and stand just a few feet from him while he grooved until 3am. He has a standing gig there every Thursday. Don’t miss it if you’re in New Orleans! I was even fortunate enough to find a copy of the New Orleans Drumming DVD sealed and new at the Louisiana Music Factory. I couldn’t believe it! 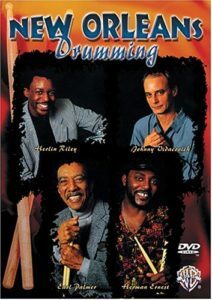 This is a classic instructional DVD that features Johnny, Herlin Riley, Earl Palmer and Herman Ernest. A streaming version is available to purchase. If you’re stuck on finding the DVD, it’s worth seeking out, though the New Orleans Jazz and Second Line Drumming book/cd is more affordable and contains a lot of the same info. I will likely post more about Johnny in the future, but for now you should go check out his interview on Drummer’s Resource and then seek out the recordings he’s played on…and check him out live when you can.